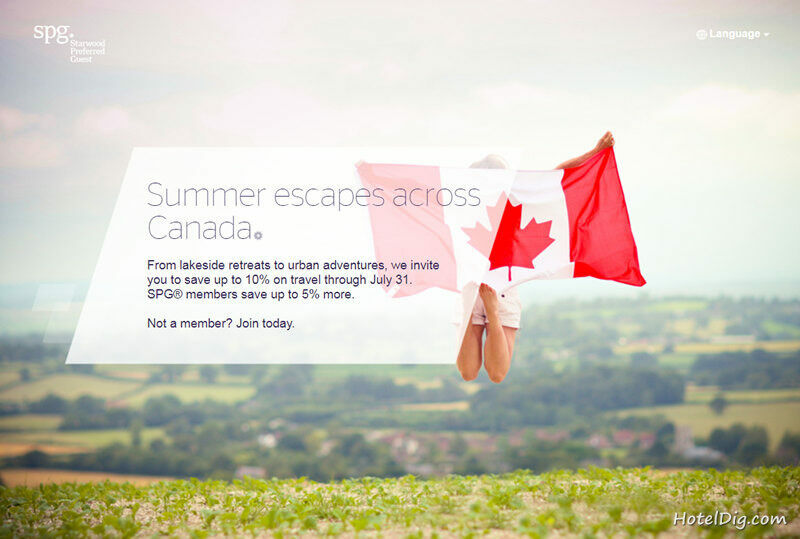 From lakeside retreats to urban adventures, we invite you to save up to 10% on travel through July 31. SPG® members save up to 5% more. Offer is valid at participating Starwood Hotels & Resorts in Canada, please see participating property list. Offer is valid for stays booked between May 1, 2018 and July 1, 2018 and completed by July 31, 2018. 14-day Advance purchase required. Credit card will be charged at time of booking. Reservations cannot be changed, are pre-paid and non-refundable; if cancellation takes place, guests forfeit total room charge plus tax. Starpoints, SPG, Preferred Guest, Sheraton, Westin, St. Regis, The Luxury Collection, W, Le Méridien, Tribute Portfolio, Element, Aloft, Four Points and their respective logos are the trademarks of Marriott International, Inc., or its affiliates. Design Hotels is a trademark of Design Hotels™.